Choosing a piano is oftentimes a difficult decision. By choosing a piano, you are choosing a musical instrument, a fine piece of furniture, an object of emotional attachment and a monetary, musical, and educational investment. When properly cared for, the average lifespan of a piano is several decades, much longer than the average automobile. 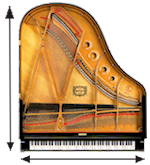 Size is an important consideration in choosing your instrument since, generally speaking, the larger the piano, the better the tone. In large part, the amount of space you have for the instrument will be an important factor in choosing the right size of instrument for you. Many people are surprised to find that they have more space than they had originally thought and are able to purchase a much larger piano. Meridian Music Company can provide you with a paper pattern to place on the floor to measure the space. But size is not the only factor to consider. Your level of aspiration & the style of your home will also help to determine the type of piano for your needs. By purchasing the best instrument possible within a comfortable price range, you are encouraging an individual to expect to continue playing and to strive for success. This can make all the difference in the world. And since a piano is a fine piece of furniture in addition to a musical instrument, your décor and furniture will help to determine which type of elegant cabinet and finish will adapt to your home. Remember, a piano is an investment that will remain with you for many years, so consider purchasing the best piano that you can afford. But, ultimately, the only true way to determine the instrument that will meet your needs is to play the piano and listen to the sound of the tones that are produced by the instrument. Let our piano experts answer your questions. Then, listen to yourself and choose the instrument that you prefer. © Copyright 2016 Meridian Music. All Rights Reserved.